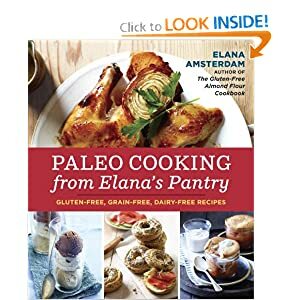 I was so super delighted to receive Elana’s new cookbook, Paleo Cooking in the mail last week. It’ll be released on June 18th and you can order it now on Amazon. Sometimes if you order early, they ship before the release date. Nope, I’m not paleo . I’m allergic to labels–they give me an instant headache. But I love good food. Real food. Tasty food. Food I can eat (minus gluten, dairy, soy, corn, sugar, etc.) And that’s exactly what’s in this book. It just so happened that I was itching to play in the kitchen when I got this, so it was perfect timing. First, I made the Tangy “Peanut” Sauce. Because I was physically incapable of waiting 24 hours and going to the store and getting coconut milk, I used blended young coconut, and my sauce was more of a thick, creamy, delicious dip. I loved it as it was, and even made a double batch. I did thin some of it to a sauce, and it’s excellent both ways. The (lack of) wisdom in making ginger ale as something to photograph didn’t occur to m e until I was taking the pictures. It would bubble when I added ice cubes, but by the time I could get my camera in position and focused, bye-bye went the bubbles. Cat sat and watched and did not offer any assistance, clearly. The ginger ale was cool and refreshing, and something I’ve long missed since giving up sugar. I also made the Rosemary Chicken (pictured above, using chicken thighs) which was simple, fragrant and flavorful. We often make a similar version of this, just without the measuring and adding dried minced garlic or onion. I was even able to talk Mr. Dude into grilling rather than baking, which made it extra delicious. The recipes were fantastic, the pictures are gorgeous and I definitely have other recipes marked, like the Cauliflower Rice and the Spicy Chai. I’m also finally considering caving in and buying an ice cream maker just for this book! I’d highly recommend it. I’ve also posted on other recipes that I’ve loved from Elana’s other books and website. Thanks, Shirley! I’m always thorough when it comes to yummy food. Thanks, Kristen! I totally agree. about wanting to make some changes in your life and maybe feel a little bit better, then you should at least try the Paleo Lifestyle. Just for fun, I’ll respond to this. I have tried a full “paleo” diet twice, once for 3 months and once for 6 weeks. (ie, I gave up beans and white potatoes–most of the rest of the classic paleo recommendations line up with what works for me.) I did not find that it gave me any additional benefits. Adding beans back did not cause any negative symptoms. So thanks, but no.